← Is Your Organization Socially Awkward? Although my blog specifically addresses emergency management, I wanted to bring your attention to a fabulous resource for healthcare and social media. The blog “Found in Cache” is fantastic: it is one to both bookmark and emulate. The author is Ed Bennett who also manages web operations at the University of Maryland Medical Center (UMMC). Read more about him here: http://ebennett.org/about/#ixzz1sUMelXbu. What impressed me the most is the data available. He has amassed an amazing list of healthcare social media policies, as well as a database of hospitals on fourquare (there are 787–who knew! ), Twitter, YouTube, Facebook, LinkedIn and Blogs. The best part… all of this data is available on a google map! Emergency Management organizations should take a moment to explore this list. Is your local hospital tweeting? Are you following them? This entry was posted in Social Media and Emergency Management and tagged Ed Bennett, Emergency management, Facebook, LinkedIn, Twitter, University of Maryland Medical Center. Bookmark the permalink. 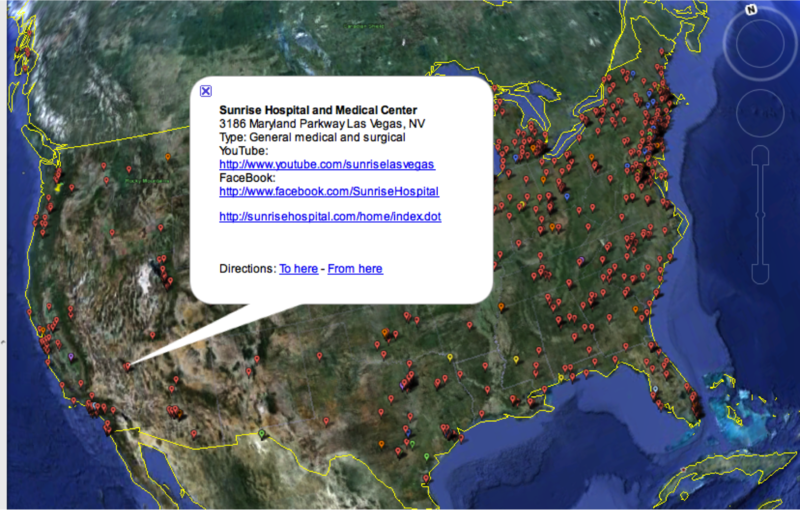 More and more hospitals are acknowledging the fact that healthcare social media is a useful tool.